The integration of indoor and outdoor space along with Tuscan styling are very popular among Las Vegas luxury home buyers. 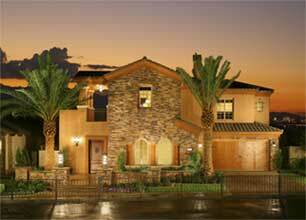 The home builder offers semi custom homes in Southern Highlands with many choices for personalization. There are a fewer than six home sites with early phase opportunities available in the present release of homes. This fantastic opportunity is located across the street from the Southern Highlands Golf Club and the homes are on a cul de sac. There are a total of 155 luxury homes in Tuscan Cliffs. This will be an exclusive enclave of Southern Highlands Las Vegas near the mountains. Estates in Southern Highlands real estate are located on lots from one quarter acre or larger. Estates are situated on lots measuring one-quarter acre or larger. Premium home sites, including mountainside parcels in future phase releases, are available. Each Tuscan Cliff home qualifies as Energy Star. Base luxury home prices range from $1.04 million to $1.25 million. Tuscan Cliffs luxury homes for sale are near end of second phase home sales in Southern Highlands.